Andy, Todd and I had watched the weather forecast all week with the intention of taking Thursday off to ride at Willamette Pass. Things were shaping up to be awesome by Thursday morning when I met Andy and we headed up to the pass. After a stop in Oakridge for some breakfast, we arrived at the Pass and it was deep. 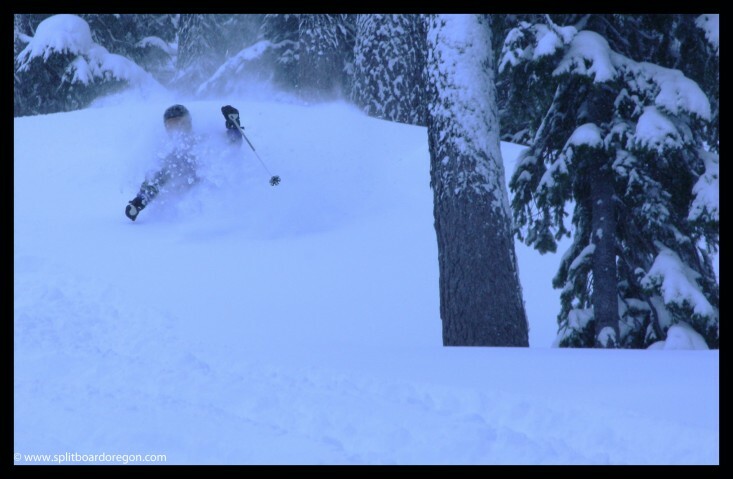 The pass doesn’t operate on Monday-Wednesday, so the 35 inches or so of new snow that had fallen over the past three days was untracked and unconsolidated. There was already a line of powder hounds forming at the bottom of the EPA lift, and we strapped in to join them. We ended up being seven or eight chairs back from first chair, and made our first run down High Lead. It was DEEP! I couldn’t find the bottom on my K2 Gryator and the snow was very unconsolidated. I ended up having to wait down at the flats for some others to break a trail so I wouldn’t get stuck. 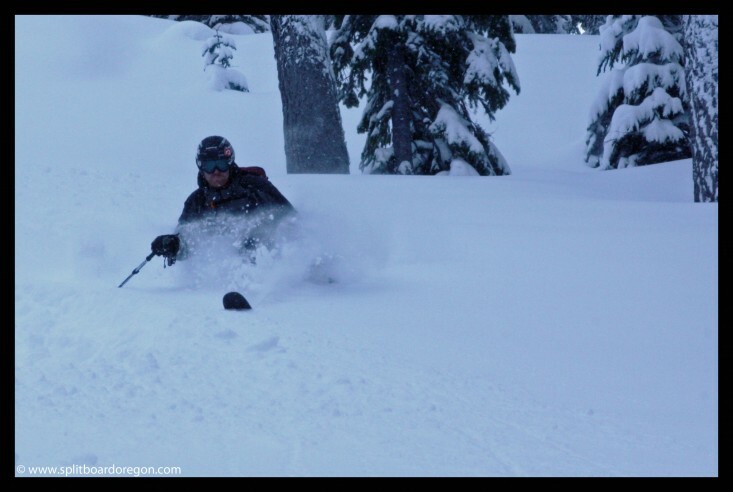 After a few more runs of epic pow, we joined up with Todd who drove up separately. Several patrolers were up playing hooky as well, and we spent the morning making runs with Dan on the frontside. 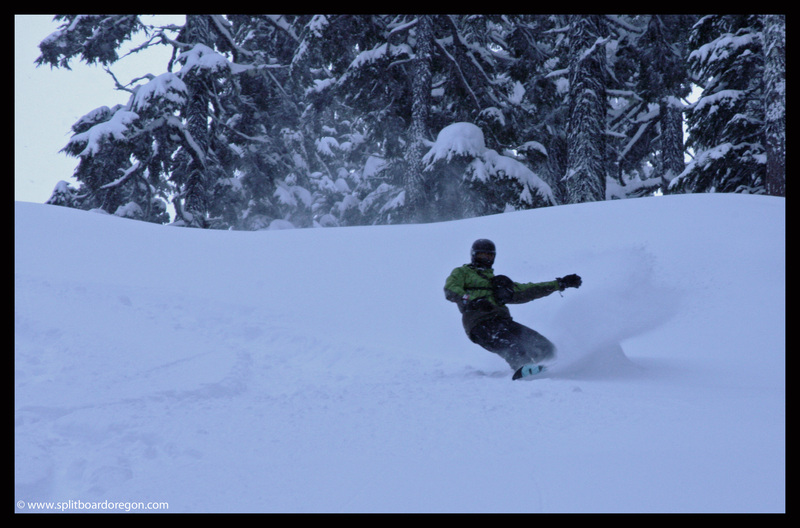 After a very quick hasty lunch, we headed back out for some more pow. It took Patrol 4 awhile, and it was a lot of work, but they finally got the backside open around 12:30, just as things on the front were getting tracked out, which worked out perfectly. Andy getting face shots on the backside! As soon as the backside opened, the three of us hiked to the top of Peak 2 and dropped into Northern, which yielded excellent deep powder and more face shots. After suffering through a long dry January, this was the kind of relief we were in need of. On the next run, we headed over to June’s, and snapped a few pictures of the action. We ended up making several thousand vertical for the day, all in over your head powder! As the backside started to get a bit tracked, we made three or four laps on Destiny, which for some reason, wasn’t getting pounded too hard. Destiny yielded nice turns and face shots on the steeper pitch, but I had to straight line it at the bottom to not get stuck. After a few more runs, Todd headed back to the front to get ready to leave. Andy and I made some more runs on the back, finding some nice untracked powder near the cliff. For our final run, we headed back through SDS directly off the top of the Peak 2 chair. By the time we made it down Swoosh on the front side and were back to the car, my legs were feeling pretty worked. The drive back was uneventful, and we made it home around the same time as people were getting off work. 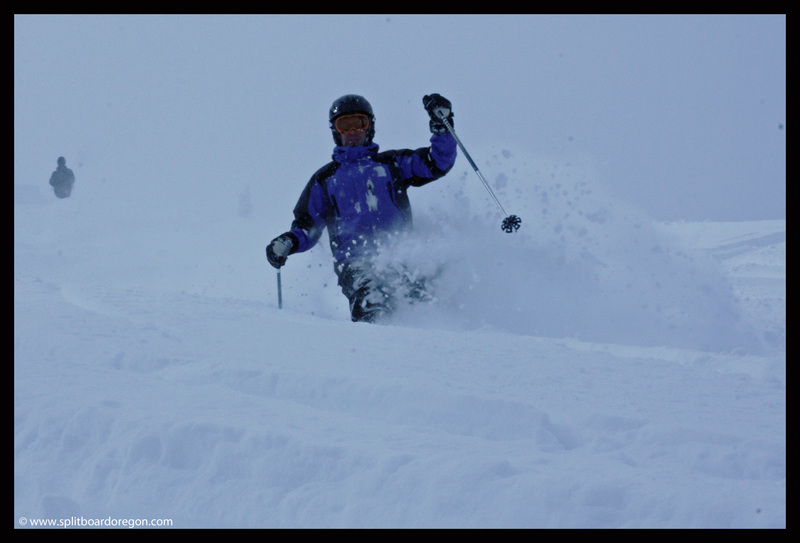 It was an excellent way to spend a day, and when the powder’s fresh and deep, you do what it takes to get to the slopes! here’s a parting shot of Todd riding on the backside…..